1. 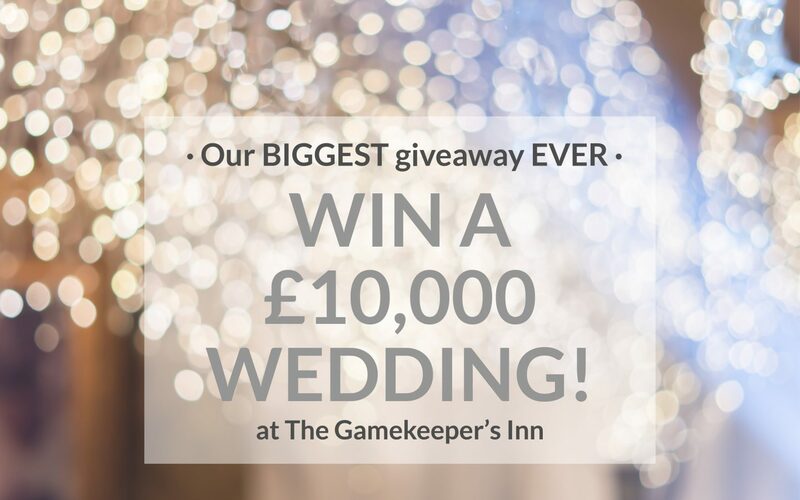 Entries to the £10,000 Wedding Giveaway competition are made either through registration on The Gamekeeper’s Inn website or via data capture forms at wedding fairs, wedding exhibitions and other related events. 2. Entries are restricted to residents of the UK and Channel Islands. 3.2. not already be a married couple. The competition does not cover ‘renewal of vow’ ceremonies or celebrations. 4. The Gamekeeper’s Inn reserves the right to reject entries from entrants not entering into the spirit of the competition including but not limited to entrants having no genuine and sustained intention to marry a specific named individual within 18 months of the date of the drawing of the winner. 5. Employees of The Gamekeeper’s Inn or their families may not enter the competition. 6. Wedding bookings already confirmed cannot use this offer in conjunction with their wedding package. 7. The Gamekeeper’s Inn reserves the right to exclude entries where all valid information has not been entered on the competition entry screens and/or entry forms. 8. No responsibility can be accepted for entries lost, damaged or due to computer error in transit. 9. The winning entry (hereafter referred to as the Winner) will be chosen no later than Saturday 18th May 2019 from all valid entries received. In the case of dispute, the decision of The Gamekeeper’s Inn managing director shall be final and binding. 10. If the Winner cannot be contacted or successful contact is not made within a reasonable time period or if the Winner fails to provide an address for delivery of the prizes or fails to meet any of the eligibility requirements or is otherwise unable to comply with the terms and conditions, it may result in forfeiture of the prize and The Gamekeeper’s Inn reserves the right to disqualify that entrant (without further liability to that entrant) and offer the prize to the next eligible entrant and thereafter until a winner is found. 11. The Winner agrees to the use of his or her and his or her partner’s name, photograph and disclosure of county of residence and both will co-operate with any other reasonable requests by The Gamekeeper’s Inn relating to any post-winning publicity including but not limited to attending all interviews and photo shoots and to discuss their respective prizes as is necessary for press coverage. 12. The Gamekeeper’s Inn reserves the right to amend these terms and conditions at any time without prior notice. Any amendments will be published on www.gamekeeperinn.co.uk. You are advised to regularly check the website for any changes. 13. The Gamekeeper’s Inn reserves the right at any time to cancel, modify or supersede the competition in any manner whatsoever if, at its sole discretion, it should decide the competition is not capable of being conducted as specified. 14. The Gamekeeper’s Inn reserves the right ask entrants for evidence to verify the conditions in paragraphs 2, 3 and 4 above and also to use whatever methods it considers appropriate to carry out such verification. The prize may be withheld until this verification is satisfactorily completed. Failure to provide satisfactory evidence may result in forfeiture of the prize without further liability to that entrant. 15. Use of a false name or address will result in disqualification. 16. All entries must be made directly by the person entering the competition. 17. Entries made online using methods generated by a script, macro or the use of automated devices will be void. 18. The prizes apply only to the Winner or his/her partner and are not transferrable to any third party. 19. No cash alternative will be provided. 20. Any outstanding balance superseding the total prize amount (£10,000) will be agreed and due in full prior to the date of the Winner's wedding (during 2020).